This week the CUNY Urban Food Policy Institute posts at eatingineastharlem.org the complete report Eating in East Harlem An Assessment of Changing Foodscapes in Community District 11, 2000-2015. The report, which we presented at the CUNY Urban Food Policy Forum on March 24th, analyzes changes in five domains -- food retail, food insecurity and food benefits, institutional food, food and nutrition education, and diet-related health conditions -- in East Harlem from before the election of Michael Bloomberg through the first two years of the de Blasio Administration. What are the take home messages from the report? First, although East Harlem is blessed with a multitude of organizations and individuals dedicated to improving local food environments and reducing food insecurity and diet-related diseases, two problems are still more common in our community than in other New York City neighborhoods. 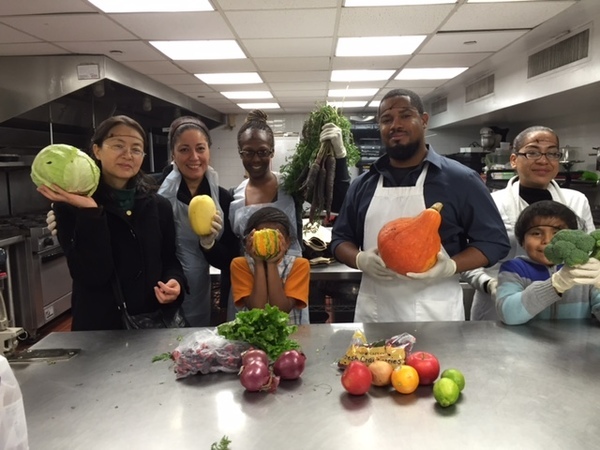 We identified 64 organizations providing nutrition education in East Harlem, more than half started since 2009; 22 food security programs, and dozens of agencies serving institutional food. 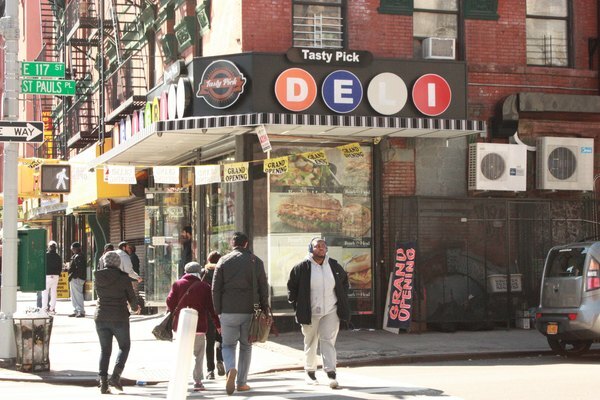 In addition to non-profit and government programs, since 2000, the number of retail food establishments in East Harlem has more than doubled from 230 to 468. These organizations and businesses constitute a sturdy foundation for improving our local food environment and demonstrate that since 2000 increasing access to healthy affordable food has become a priority for many in our community. But more does not necessarily mean better. Food establishments selling mostly unhealthy food increased more rapidly than healthy food outlets. East Harlem is neither a food desert, where healthy food is unavailable, nor a food swamp, where only unhealthy food can be purchased. Rather, it is a complex landscape where price, quality and access vary both within East Harlem and compared to other neighborhoods. A decade ago, many believed that more supermarkets were the solution to our food problems. However, even as the number of supermarkets has nearly doubled since 2000, while diet-related diseases have remained persistent, we now understand there is no single fix. Improving East Harlem's food environments will require the many public, nonprofit and private organizations that now shape these environments to define common goals, coordinate activities, and agree on the metrics that can constitute success. In our survey of organizations conducting nutrition education in East Harlem, for example, we identified several key populations that appear to be underserved by these programs. These include senior citizens, young children, recent immigrants, and people with diet-related diseases. Each of these groups has distinct dietary vulnerabilities yet so far no process is in place in East Harlem (or New York City for that matter) to match unmet needs with organizational capacity and resources. Can we act to fill this gap within the next few years? Our report also found that focusing on food related policies tells only part of the story of East Harlem's food environments. New York City's high rates of income inequality and the rising rates of low wage jobs explain why so many East Harlem families don't earn enough to afford healthy food. On another front, real estate development and housing policies contribute to the pressures that force affordable supermarkets to close, replaced by higher end food retailers that cater to the wealthier people moving into East Harlem. As a result, the rezoning and affordable housing initiatives in East Harlem, important as they are, may have the unintended consequence of decreasing access to healthy affordable food. Now is the time for housing and food activists, elected leaders, and city officials to work together to avert these possible adverse impacts. To give another example of how non-food policies affect diet and health, raising the minimum wage may do more to put more money in people's pockets to be able to buy healthier food than any food policy. The recent state level increase of the minimum wage to $15 an hour is a good step in the right direction but more needs to be done to reverse the last two decades of federal and state economic, wage and tax policies that shifted income from the poor to the wealthy and limited social wages. Pathmark Supermarket at 125th Street and Lexington Avenue was sold to developers in April 2014 for $39 million. Another insight from our report is that the five domains we examined intersect to influence food security and diet-related diseases. For example, increasing numbers of East Harlem residents with SNAP benefits (until 2013), greater availability of fruit and vegetables, the Health Bucks program, and the many local nutrition education programs may have combined to contribute to the increases in fruit and vegetable consumption by East Harlem adults. While our study lacked the ability to attribute observed changes to any single policy, in the future studies should consider the cumulative impact of many policies. From the successful efforts to reduce tobacco use in New York City, it is known that multiple policies are often more effective than any single policy change. By learning to examine our local food system as a whole, we can better identify the multiple opportunities for improvement. Our study confirmed our belief that local studies of community food environments can yield evidence that can highlight local successes and failures. In the last two decades, New York City has worked hard to make more data available to community residents and leaders so they can participate more fully in policy deliberations. But we found many indicators of food environments unavailable at the scale we needed: Which food programs are available in what East Harlem schools? How good a job are various other agencies within East Harlem, including child care programs, senior centers and youth agencies doing in their institutional food programs in meeting the New York City Food Standards? And the variety of data sources we used to assess changes in the number of retail food establishments in East Harlem over time provided different answers to what appeared to be the same questions. By providing more reliable, accessible, and user friendly data on local food environments, public agencies and universities can better engage communities in taking action to improve these environments. Finally, this report, which we began when our staff was based at the New York City Food Policy Center at Hunter College and completed in our new home at the CUNY Urban Food Policy Institute at the CUNY School of Public Health, reaffirmed the value of CUNY faculty, staff and students to working with communities for healthier, more equitable food environments. Faculty from the School of Public Health, Baruch, Hunter and Brooklyn Colleges helped with the research and analysis, contributing perspectives from nutrition, urban planning, sociology, political science and public health. Undergraduate, Master's and doctoral students from these and other disciplines contributed data, analysis and help in writing. We hope this report proves of value to the people and leaders of East Harlem, food justice activists in other communities, city agencies, and to our faculty colleagues and students. We invite partnerships with other communities and organizations to apply what we have learned in other settings. Please read Eating in East Harlem, tell us what you think, correct our mistakes, fill in the gaps (send emails to urbanfoodpolicy@sph.cuny.edu) and help us to write the next chapters of creating healthy foodscapes in East Harlem. On May 2, the CUNY Board of Trustees approved the creation of the new CUNY Urban Food Policy Institute. We're now an official CUNY Institute and look forward to exchanging with others at CUNY, in New York and in other cities around the world new ideas and approaches to using food policy to reduce food insecurity and diet-related diseases and promote community development and social justice. We are pleased to announce a new project, New York Food Policy Monitor, which will provide a platform and resources to help policy makers, city officials, advocates and communities to track progress in improving the policies that shape food environments and their profound health and social consequences. New York Food Policy Monitor is a communications and policy platform developed by the CUNY Urban Food Policy Institute that will build on our efforts to track the development and implementation of food policies and programs in New York City and State. Food Policy Monitor will also synthesize existing evidence on the impact of food policy to inform recommendations for evidence-based strategies to make the local and regional food system healthier, more resilient and more accountable to city and state residents. This project aims to enable a wider set of players to take action to improve the performance of the numerous city and state agencies that affect the way food is managed in New York. We thank the New York Community Trust for their generous support for Food Policy Monitor and will share updates as we launch this exciting new project. On April 19th, Jennifer Yeaw, New York City Human Resources Administration, presented the agencies latest efforts to increase access to food benefits to New Yorkers. Respondents included Brady Koch, Chief Operations Officer, the Food Bank for New York City, and Maureen Lane, co-director, Welfare Rights Initiative, Hunter College. Institute Senior Faculty Fellow Jan Poppendieck served as moderator. Delobelle P, Sanders D, Puoane T, Freudenberg N. Reducing the Role of the Food, Tobacco, and Alcohol Industries in Noncommunicable Disease Risk in South Africa. Health Education & Behavior. 2016;43(1 Suppl):70S-81S. Noncommunicable diseases (NCDs) impose a growing burden on the health, economy, and development of South Africa. According to the World Health Organization, four risk factors, tobacco use, alcohol consumption, unhealthy diets, and physical inactivity, account for a significant proportion of major NCDs. We analyze the role of tobacco, alcohol, and food corporations in promoting NCD risk and unhealthy lifestyles in South Africa and in exacerbating inequities in NCD distribution among populations. By expanding the practice of health education to include activities that seek to modify the practices of corporations as well as individuals, South Africa can reduce the growing burden of NCDs. Freudenberg N. Healthy-food procurement: using the public plate to reduce food insecurity and diet-related diseases. Lancet Diabetes & Endocrinology. 2016;4(5):383-4. doi: 10.1016/S2213-8587(16)00078-4. Around the world, municipal, provincial, and national governments are using food procurement—the purchase, preparation, and serving of food in public institutions—to improve the diet and nutritional health of vulnerable populations. Schools reach the highest number of people who dine from the public plate, but childcare centres, hospitals, correctional facilities, and youth programmes also serve food to populations at risk of food insecurity, obesity, and diet-related diseases. Freudenberg N, Silver M, Hirsch L, Cohen N. The Good Food Jobs Nexus: A Strategy for Promoting Health, Employment, and Economic Development. Journal of Agriculture, Food and Community Development. 2016(62):283-301. In the aftermath of the Great Recession, cities have looked to the rapidly growing food sector as a promising source of new employment, and yet most of the sector's growth has come from low-wage, dead-end food jobs. A strategy to simultaneously increase food employment, improve conditions for food workers, and enhance access to healthy and affordable food to improve public health requires pursuing a "good food jobs" approach that supports policies and programs that advance all three goals. To inform such a strategy, this article analyzes policies and programs to create good food jobs in New York City and discusses how these efforts must navigate conflicts among job growth, job quality, and food access and quality. It recommends strategies cities can use to advance a good food jobs strategy, analyzes obstacles, and suggests research that will produce evidence to help cities develop and evaluate policy approaches that contribute to stronger economies and better health. Smith K, Dorfman L, Freudenberg N, Hawkins B, Hilton S, Razum O, Weishaar H. Tobacco, Alcohol, and Processed Food Industries–Why Do Public Health Practitioners View Them So Differently? Frontiers in Public Health. 2016;4, 64. The engagement of public health practitioners and researchers with tobacco industry is now highly controversial leading many scholars to eschew interactions with the industry. Reflecting this, many leading journals now refuse to publish tobacco industry funded research . Yet, many public health officials consider dealing with the processed food, soft drink, and alcohol industries as normal practice, treating them as legitimate partners in improving population health. What is the rationale behind such different approaches to dealing with these industries, given that their products have a significant adverse impact on population health and their business strategies use similar approaches when it comes to marketing, product design, policy influence, and challenging evidence of harm?